These Farm Heroes level 215 cheats and tips will help you beat level 215 of Farm Heroes. 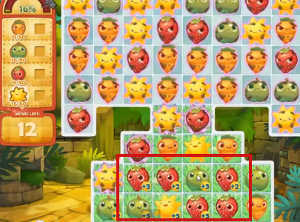 The objective of Farm Heroes level 215 is to collect 80 carrots, 80 strawberries, 80 apples, and 80 suns in just 24 moves. This level is a peculiar shape that prevents cropsies from entering the grass-filled bottom of the board except through a narrow channel in the middle. This channel is covered by flowers and ice, so you’ll need to break the ice in order to open the flowers. Try to remove the top ice blocks first. This is most easily done with horizontal matches simply because there is more room horizontally. 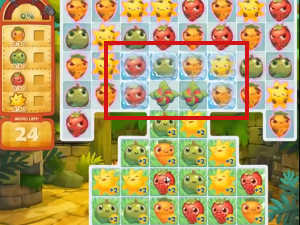 Once the ice is broken, you can try to potentially open both flowers at once with your next matches if they are horizontal, to save a move or two. Once you’ve cleared the way through to the bottom, start making matches in the grass, where bonuses are easy to accumulate. No matches in the top part of the board will count toward your score, since everything will fall onto the board grumpily. Don’t make any matches whatsoever in the top portion of the board. Only make moves in the grass after you’ve removed the flowers. Otherwise, your cropsies there will be isolated and less likely to be triggered into starting a cascade. Wait for grumpy cropsies to turn happy before matching them, otherwise the match won’t yield anything towards your goal. Every match you make in the grass will help you get to 100% growth, since there are no cropsies besides those you need to complete your objectives. To make sure you have moves left over for Hero Mode, match the cropsies that have the most bonuses together to quickly raise your growth level. If you’re running low on big matches, make some matches on the very bottom row to try to trigger a cascade. Make matches of four or more in the grass to get significantly more bonus points on each match made.